Lazy Seamstress: How about another give away? 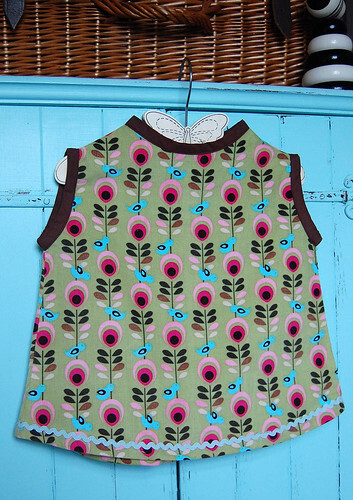 This little dress was unfinished and forlorn,(part of the re drafting process for Flossie's Pinafore.) 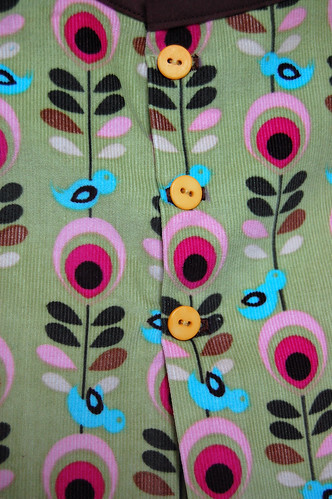 but I hastily* added some bias trim and a few buttons, and now I have no use for it. I'm guessing someone out there might have use for it, so time for another give away I think. It's sized to fit approx 18mth to 2 years, fastens at the back with buttons. Looks cute over a long sleeved tee, with tights, leggings or jeans. Just leave me a comment and I'll use random.org to draw a winner on Friday. Offer open world wide. * When I say hastily, I mean it's serviceable, but I wouldn't say I took as much care over my stitching as I would for something I might sell or gift. Ooohhh, that's adorable. Please enter me - my niece will look gorgeous in it once she's big enough to wear it! i have a tiny two year old who would look absolutely adorable in this dress (she's about 12-18mo size at the mo! ), so we would absolutely love to be entered into the draw. That is too cute! And it would just fit my baby! ahhh wish I had one small enough for it, Jeanette! I don't suppose you'd ever make similar dresses for older girls? I love all my girls in pinafores! I have a tiny two year old too (generally wearing 9-12 months!!) plus it would look cute on her little sister as well in a couple of year's time so please could we be entered into the draw. Oh that is just precious! My daughter would look adorable in it. We'd love to be entered in the contest. I would love to be entered for your draw. That pinafore is adoreable! I check your blog most days and find you a real inspiration! How sweet! Please enter me and my little one too. Would love to be in the draw Jeanette ! As usual your work is lovely ! HUGS to you today ! oooh i'd love it for my sister's baby girl. due in a few weeks. I'd love to be entered Jeanette, it's a gorgeous dress! How lovely - what a beautiful dress! It would fit my dd perfectly in spring and summer. I would love to be entered in the draw! That is adorable! I would love to be entered in the drawing! I would also love to know what the fabric is called. It is so cute! That is so lovely, please enter me, my little lady would look fab in it! ooh that's lovely Jeanette. I have a couple of friends having babies soon, so I'd love to go in your draw. Are you putting any patterns up again soon? May my little girl and I join the draw? Such a sweet dress. I really enjoy your blog. Your projects are so creative. Your family is often in my thoughts and prayers.